In September 2015, a survey-excavation was conducted at Khirbat esh-Sheikh Madkur (West; Permit No. A-7526; map ref. 199099–200264/616687–7916; Fig. 1), as part of a research project. The survey, undertaken on behalf of the Israel Antiquities Authority and the Institute of Archaeology of the Hebrew University and financed by the Jewish National Fund, was directed by I. Radashkovsky and E. Liraz, with the assistance of H. Shalev, O. Shalev and T. Shabi (area supervision), I. Lidsky-Reznikov (pottery drawing), A. Karasik (digital documentation of the flint artifacts), D. Levi and A. Eirikh-Rose (mapping). Additional assistance was rendered by D. Ben Ami, P. Betzer, H. Neugeboren, J. Uziel and H. Khalaily (consultation) and volunteers from the public who participated in the project. Khirbat esh-Sheikh Madkur, a tell at the northeastern edge of the Shephelah hills, is situated at the edge of a spur that descends from south to north and is surrounded on three sides by relatively steep slopes of Nahal Ha-’Ela on the north and east and Nahal Guvrin on the south. The tell rises 439 m asl, c. 120 m above the stream bed of Nahal Ha-Ela. 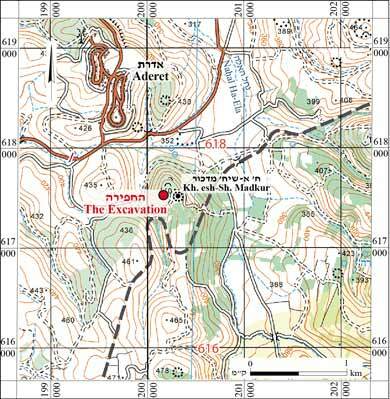 The tell was identified as Tel ‘Adullam due to its location in the Judean Shefelah, near Kh. ‘Id el-Minya (Kh. ‘Id el-Miya) and the ceramic finds it yielded (Clermont-Ganneau 1875; Conder and Kitchener 1883:354; Albright 1924; Kallai 1972; Aharoni 1989). In the past, several surveys were carried out on the tell, where the remains of a village and rock-cut caves were identified (Guérin 1869; Conder and Kitchener 1883:354; Dagan 1992:149–150, 272) and pottery sherds ranging in date from the Chalcolithic period to the Ottoman period were collected (Dagan 1992). A hiding refuge from the time of Bar Kokhba was discovered during the course of a salvage excavation on the tell (Zissu 1999). The project comprised a sample survey of the surface followed by an excavation to a depth of 0.2 m in six squares of equal size. The purpose behind the survey’s methodology (also known as shovel testing) was to determine the extent of the settlement at the site during the various periods from the relative distribution of the pottery. This method has been tried in the past at several sites in Israel, has evolved in recent years and its use has been expanding (Portugali 1982; Shenkman 1999; Uziel and Maeir 2005; Leibner 2009; Uziel and Shai 2010; Faust and Katz 2012). The tell was first divided into sub-areas, in accordance with the terrain and architectural remains, such as agricultural fences, pits, stone heaps. In each sub-area, a sampling of several squares (5 × 5 m) were marked, and six were eventually studied (Fig. 4); all of the pottery sherds were collected from the surface of the square. Subsequently, another sub-square (2 × 2 m; Fig. 5) was marked in a corner of each square; here, the excavation (depth c. 0.2 m) was mainly of top soil, where there were no architectural remains. The soil from the excavation was sifted, and all of the pottery was collected, The pottery sherds were sorted, counted and analyzed with the help of ceramists specializing in all of the periods. The gathered pottery sherds dated from the Early Bronze Age to the Ottoman period. They represent a diverse assemblage, which included bowls from the Iron II (Fig. 2:1), the Roman (Fig. 2:2), the Byzantine (Fig. 2:3) and the Early Islamic (Fig. 2:4) periods; a Judean krater from the Iron Age (Fig. 2:5); a mortarium from the Hellenistic period (Fig. 2:6); a cooking pot from the Early Islamic period (Fig. 2:7); fragments of holemouths from the Early Bronze Age and the Iron II Age (Fig 2:8,9); jars from the Iron II (Fig. 2:10), the Hellenistic (Fig. 2:11, 12), the Early Islamic (Fig. 2:13, 14) and the Ottoman (Fig. 2:15) periods; a jug from the Hellenistic period (Fig. 2:16); and a jug from the Ottoman period (Fig. 2:17). 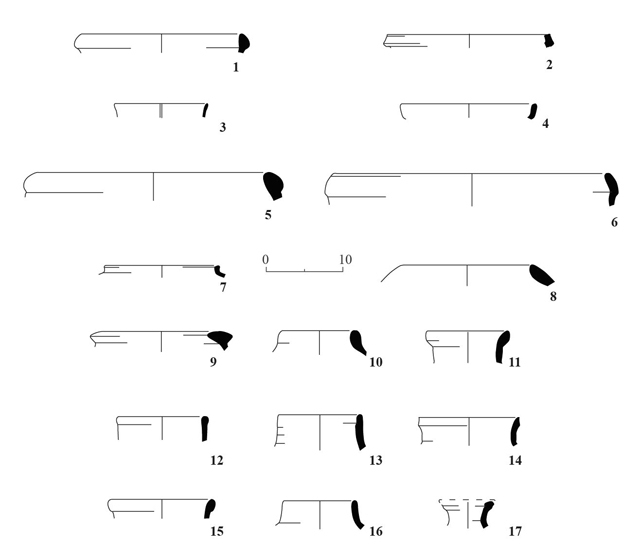 In addition, bifacial flint tools characteristic of the Pre-Pottery Neolithic A (Fig. 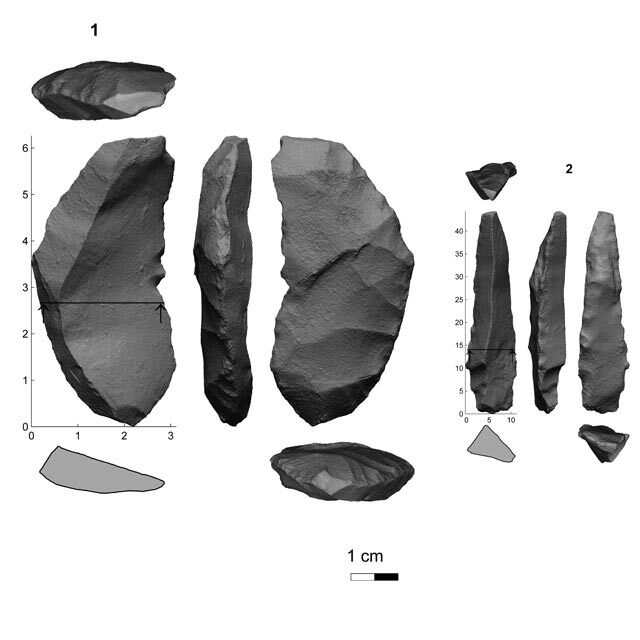 3:1) and a drill from the Chalcolithic period (Fig. 3:2) were found. The ceramic finds collected from the six survey-excavation squares, particularly at the center of the site, are indicative of the human activity that transpired there during the abovementioned periods. The breakdown and geographic distribution of the finds will be published in the final report with at aim of mapping the human activity around the mound during the various periods. The work at the site involved layperson volunteers, adding an educational and public value to the project. Aharoni Y. 1989. The Land of the Bible: A Historical Geography. London. Albright W.F. 1924. Researches of the School in Western Judaea, BASOR 15:3–4. Clermont-Ganneau Ch. 1875. The Site of the City of Adullam, PEFQSt for 1875:168–177. onder C.R. and Kitchener H.H. 1883. The Survey of Western Palestine III: Judaea. London. Dagan Y. 1992. The Shephelah during the Period of the Monarchy in Light of Archaeological Excavations and Surveys. Tel Aviv (Hebrew). Faust A. and Katz H. 2012. 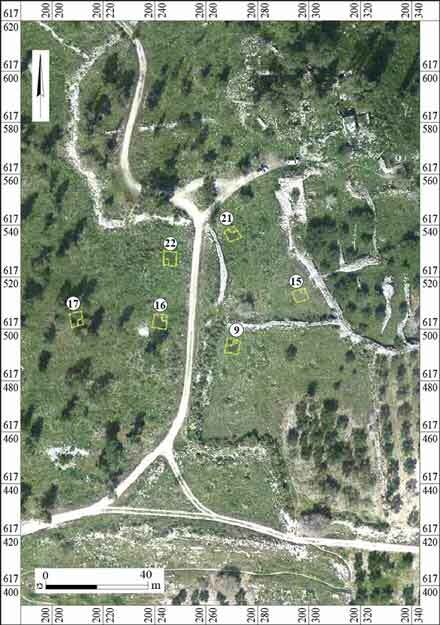 Survey, Shovel Tests and Excavations at Tel ‘Eton: On Methodology and Site History. Tel Aviv 39:158–185. Guérin V. 1869. Description géographique, historique et archéologique de la Palestine 3: Judée. Paris. Kallai Z. 1972. ‘Adullam. Biblical Encyclopedia 6. Jerusalem. Pp. 93–94 (Hebrew). Leibner U. 2009. Settlement and History in Hellenistic, Roman and Byzantine Galilee: An Archaeological Survey of an Eastern Galilee. Tubingen. Portugali Y. 1982. A Field Methodology for Regional Archaeology (the Jezreel Valley Survey, 1981). Tel Aviv 9:170–196. Shenkman Y. 1999. Excavation Survey as a Method for Clarifying Settlement History: Kefar Hananya as a Case Study. M.A. thesis, Bar-Ilan University. Ramat Gan. Uziel J. and Maeir A.M. 2005. Scratching the Surface at Gath: Implications of the Tell es-Safi/Gath Surface Survey. Tel Aviv 32:50–75. Uziel J. and Shai I. 2010. The Settlement History of Tel Burna: Results of the Surface Survey. Tel Aviv 37:227–245. Zissu B. 1999. A Hiding Refuge at Tel Odollam. Niqrot Zurim 20:69–78 (Hebrew). 4. The marking of the squares in the excavation area. 5. An example of a sub-square (L16), looking south.